Ethiopian government forces killed four people and wounded 18 others Thursday in the town of Soda in the restive Oromia region. Residents, who asked for anonymity out of fear of retaliation by the Ethiopian government, told VOA’s Horn of Africa service that eight trucks escorted by federal forces were stopped by residents of Soda and surrounding villages, suspecting the trucks were transporting weapons to special "Liyu" police in the neighboring Somali region. Kulultu Fara, security chief of the Dirre district in the Oromia region, said, "The federal forces were angered by the residents' demand to stop the trucks and opened fire, killing four people." He said the eight trucks suspected of transporting weapons remain in Soda, and federal government officials are talking with locals in an effort to resolve the conflict. In the meantime, protests continued Thursday in several Oromia towns. Businesses were closed in the restive town of Shashemene, where protesters were killed Wednesday by federal forces, according to a regional official. Addisu Arega, head of the regional government's communications affairs bureau, told VOA that at least six people were killed and more than 30 wounded during protests in several Oromia cities and towns Wednesday. Addisu said three people were killed in Shashemene, 250 kilometers southeast of Addis Ababa, and three more were killed in Bookee, in the West Hararge zone of Oromia. He added that a fourth death that was reported Wednesday in Shashemene was not related to a political incident. On Thursday, a funeral gathering to bury those who were slain turned into a demonstration. A witness to the demonstration told VOA that members of several other ethnicities joined the funeral crowd, expressing solidarity with the Oromos and chanting anti-government slogans. Addisu blamed unspecified forces for instigating young people to participate in spontaneous protests, which resulted in loss of life. Witnesses in Shashemene told VOA that federal government forces opened fire on demonstrators who marched past their camp. 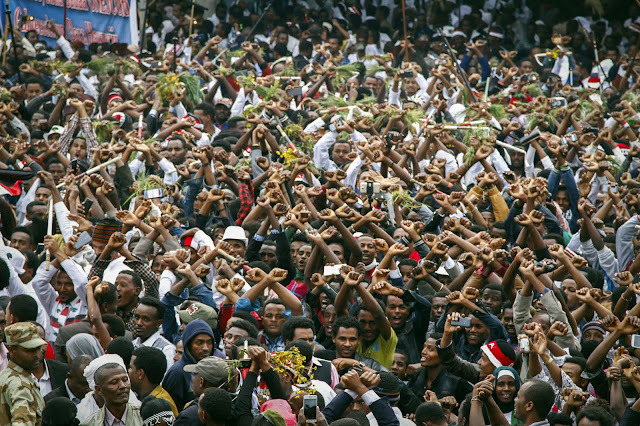 Oromia has experienced periodic, sometimes violent anti-government protests since late 2015. The protesters in Shashemene were calling for the release of detained political leaders, economic justice, and ending displacements and expulsions of Oromos from towns and villages of the Somali region. On Wednesday, the U.S. embassy in Ethiopia issued a security message advising Americans not to travel to Shashemene and adjacent areas at this time. A large but peaceful protest took place Thursday at Ambo University in the town of Wolisso. University lecturer Seyoum Teshome told VOA that thousands of demonstrators chanted, "Down, down, Weyane," a reference to Ethiopia’s ruling EPRDF coalition, and demanded the release of political prisoners. Teshome said police watched the protest but took no measures to stop it, and the town was calm by midday. Shashememe is a business and transportation hub that connects gold, coffee and other cash crops produced in southern, southeastern, eastern and mid-northern areas of Ethiopia.